Be the first to share your favorite memory, photo or story of Bert. This memorial page is dedicated for family, friends and future generations to celebrate the life of their loved one. 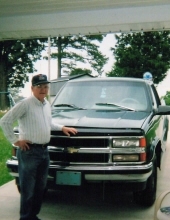 Bert B. Powell was born January 30, 1936 in Jackson County and departed this life Sunday, April 14, 2019 at his residence, being 83 years of age. He was the son of the late Albert & China (Turner) Powell. Bert B. is survived by his son, Jerry Powell and his wife Patty of Sand Gap. He was blessed with a grandson, Jeremy Powell of Sand Gap. He is also survived by two brothers, Arnold Powell of Sand Gap and Hershel Powell of Olympia. He was also blessed with his caretaker, Beverly Flannery. In addition to his parents, Bert B. was also preceded in death by his wife Lois (Bowles) Powell and by two brothers, Thurman & Vivan Eugene Powell. "Email Address" would like to share the life celebration of Bert B. Powell. Click on the "link" to go to share a favorite memory or leave a condolence message for the family.